This article is about the X-Men characters. For the Dungeons & Dragons creature, see Xorn (Dungeons & Dragons). It has been suggested that this article be merged into List of Marvel Comics characters: X. (Discuss) Proposed since August 2018. Cover of New X-Men #127 (Jun. 2002), featuring Xorn. Pencils by Frank Quitely. First appearing in New X-Men Annual 2001, Xorn was created by Grant Morrison and Frank Quitely. Originally depicted as a Chinese mutant with a "star for a brain," he is eventually revealed to be the X-Men's nemesis Magneto in disguise at the climax of Morrison's run. After Magneto is apparently killed in the "Planet X" story arc, he appears alive and well a few months later in 2004's Excalibur (Vol. 3) #1, which established that Xorn never was Magneto. Marvel has presented several partial explanations, both in the comics pages and in the press as to the true nature, identity, and motives of Xorn. Xorn debuts in New X-Men Annual 2001 imprisoned by the Chinese government, where a corrupt mutant official offers to sell him to John Sublime. Xorn is forced to wear a skull-like mask designed to restrain his energy output as he has a "sun" for a brain in his head. The X-Men and Sublime's U-Men find Xorn just as he is attempting to commit suicide by removing his mask, which would destroy the Earth. Cyclops (with the help of Emma Frost) is able to establish contact with Xorn, convincing him not to kill himself, and offers him a position among the X-Men. Xorn is next seen in New X-Men #122, where Cyclops tracks him down to a monastery, where he is told by the monks that Xorn has demonstrated healing powers. The pair are captured by the Shi'ar but arrive at the X-Mansion in time for Xorn to heal the X-Men of a nano-Sentinel infection, restoring Professor Xavier's ability to walk in the process. Despite the ordeals through which he had passed, Xorn is optimistic, open, and even somewhat naive. Xorn keeps a diary to share his thoughts with Professor Xavier, since Xavier is "blinded by the sun beneath [his] mask" and cannot read his mind. Here he details his interactions with Chinese immigrants and the residents of Mutant Town in New York City, in particular an incident where he failed to save a young mutant from being killed by frightened policemen. 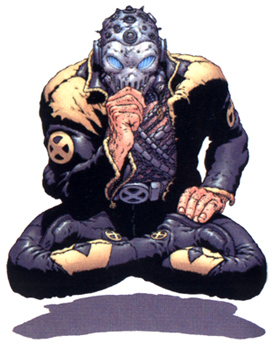 Xorn is soon put in charge of the "Special Class", a group of physical and social misfits attending the Xavier Institute. Though he hopes to befriend these students, he becomes disillusioned as they mock and insult him. He remains determined to help his Special Class, even saving their lives from a group of U-Men. In the storyline "Planet X", Xorn removes his mask, revealing himself to be the X-Men's nemesis Magneto, who has been believed dead since the destruction of Genosha. Magneto explains that the Xorn identity was an elaborate ruse crafted with the help of Chinese supporters, in order to infiltrate the X-Men; even the prison was a fake. Having returned Xavier to a crippled state (Xavier had not been healed; Magneto merely used the nano-Sentinels to "glue" his spine together), Magneto levels the X-Mansion and conquers New York City, where he enslaves the human population and destroys much of the city. He attempts to recreate the Brotherhood with Toad, the rebellious Stepford Cuckoo Esme, and the members of Xorn's Special Class. Magneto finds, however, that many of his recruits are unresponsive to his ideas and approach, with some asking for the return of the more humane Xorn, and others doubtful that Magneto has truly returned, much to his chagrin. Indecisive and relying heavily on the drug Kick to augment his power, he struggles to maintain the loyalty and respect of his followers. He announces a plan to invert the planet by reversing its magnetic poles, and employs increasingly fascistic methods (including the construction of a Nazi-esque crematorium in which he plans to eradicate the remaining human population of the city). He also appears to be experiencing a form of Dissociative identity disorder, as the "Xorn" persona begins to manifest itself as a voice within Magneto's head, claiming to be the embodiment of Magneto's wisdom, idealism, and nobility. After his defeat at the hands of the X-Men, but before his capture, he fatally wounds Jean Grey; Wolverine, in a berserk fury over Grey's death, decapitates him. Grant Morrison intended Xorn to be Magneto from his first appearance. As Morrison stated in an interview after he left New X-Men, "In my opinion, there really should not have been an actual Xorn - he had to be fake, that was the cruel point of him". In fact, soon after the revelation of Xorn's identity in New X-Men #146, readers pointed out that clues that Xorn was actually Magneto had been hidden throughout Morrison's run. According to then-X-Men writer Chuck Austen, the X-Men editors liked the Xorn character and hoped Morrison would change his mind about the revelation; when he did not, they asked Austen to bring Xorn back as a separate character. Morrison has expressed criticism of this subsequent retcon in interviews. Marvel also wanted to continue using Magneto; Austen stated that "Marvel saw value in Magneto not being a mass-murderer of New Yorkers." Marvel retconned the Xorn/Magneto revelation and brought back Xorn and Magneto after Morrison's departure. In Uncanny X-Men #442 and 443, Xavier takes the body of Magneto to Genosha where they hold a funeral for the deceased mutant leader. However, in the last page of Excalibur #1, Xavier meets Magneto alive and well on Genosha. In subsequent issues of Excalibur, Xavier and Magneto debate the true identity and motives of Xorn, the individual whose bandage-wrapped body they brought to Genosha. In the same month Magneto returned in Chris Claremont's new Excalibur book, Austen's X-Men #157 introduced a new Xorn named Shen Xorn. Shen Xorn claims to be the twin brother of the original Xorn (now referred to as Kuan-Yin Xorn) who, under the influence of the entity known as Sublime, had pretended to be Magneto. This claim is supported when Emma Frost conducts a thorough mind scan of Shen. Not too long after, Shen Xorn disappears after he unleashes the gravitational forces of his "black hole" for a brain from his head (in direct contrast to his twin brother) in the course of helping the X-Men defeat an attack by a Brotherhood of Mutants led by Exodus. During the events of the House of M miniseries, millions of mutants find themselves suddenly depowered after Scarlet Witch speaks the phrase "No More Mutants". Among them are Magneto and Shen Xorn. The true identity of Xorn, and his relationship to the character Magneto, became a subject of confusion to fans. Marvel refrained from giving a complete explanation, eventually hinting that the summer 2005 crossover House of M would clear up the situation. The Xorn entry in the Official Handbook of the Marvel Universe: X-Men 2005 stated that "Kuan-Yin eventually revealed himself to be a duplicate of the X-Men's nemesis Magneto, a transformation believed to have been caused by Magneto's daughter, the Scarlet Witch." This explanation was based on a suggestion in House of M #7 wherein Doctor Strange speculates that Wanda has been 'playing with the world' for far longer than even she knows, and may have been responsible for her father's puzzling rebirth. An alternative explanation has since been given in the pages of New Avengers since, according to Marvel editor Tom Brevoort, "nobody was satisfied with that offhanded non-explanation, and it didn’t make a heck of a lot of sense by itself even as a throwaway". Later the collective power signatures of the depowered mutants arrive in Alaska and merges with a postal worker named Michael Pointer, he himself a mutant. Disoriented, he enters Canada and, wielding the power of fifty mutants, kills every member of Alpha Flight except Sasquatch, and goes on a rampage destroying downtown Cleveland. Spider-Man and the Vision find that its energy signatures match up with the depowered mutants. On Genosha, the Collective repowers Magneto, who recognizes the intelligence controlling it as Xorn just as the New Avengers arrive. Xorn explains that he took the image of Magneto, because he knew mutants would follow him, and that they needed the real Magneto again. Reference is made to Xorn's confusing history as Vision comments that his files on Xorn are incomplete, with Wolverine later commenting, "Xorn's files on Xorn are incomplete", demonstrating how not even Xorn seems to be certain who he is. Iron Man, Ms. Marvel, and the Sentry combine their powers and send the Collective/Xorn into the sun; Pointer is separated from the Collective. However, Pointer still has access to the powers of the Collective, and, as of the end of the Civil War miniseries, is coerced into joining the newly formed Omega Flight, using a suit designed to harness his powers. Marvel editor-in-chief Joe Quesada in a 2006 Newsarama interview reiterated the Shen Xorn/Kuan-Yin Xorn explanation, but added that "because Xorn's powers were psychokinetic, and his personality was so strong, it basically remained an almost disembodied sentient thing among the big ball of mutant energy. When that energy got sucked down to Earth by Michael and all absorbed by him, Xorn was the dominant personality in the mix, and that's what drove him towards Genosha and Magneto." During HYDRA's overthrow of the United States government as seen in the Secret Empire storyline, Shen Xorn is chosen to lead New Tian, a sovereign nation created for mutants somewhere in California. It is later revealed that Emma Frost is the true leader of New Tian and that Xorn is the puppet ruler that she controls with her telepathy. In the 10th anniversary of the Age of Apocalypse which takes place right after the nuclear attack by the Human High Council, Xorn is found by the X-Men in the Breeding Pens following the fall of Apocalypse. In this reality Xorn is female and claimed that her mutant abilities manifested while she and her family were workers in the Seattle Core during the riots that killed the members of Generation Next. Magneto immediately offered her a place with the X-Men. During her time with the team, Xorn never removed her helmet causing some to believe it contained her energy powers while others in the X-Men whispered that the helmet truly concealed hideous scars from her time in the Core. However the truth was that Xorn was actually the thought deceased Husk who had been manipulated by Mister Sinister and assumed the identity of Xorn and used her husking abilities to enable herself to demonstrate many different powers, in order to infiltrate the X-Men and kill Magneto and Rogue's son, Charles. A new, female version called Lady Xorn later appears as part of a future team of X-Men that travels back to the present during the Battle of the Atom event. This Xorn is later revealed to be an adult version of the "young" time-displaced Jean Grey, who needed the Xorn mask to control her powers. The team of X-Men she was with was actually the Brotherhood of Mutants from the future, the nemesis of the true X-Men, and she died when her powers went out of control in a battle between the X-Men and the future Brotherhood at Cape Citadel. Xorn later returns alive, and once again battles the X-Men with the rest of the future Brotherhood. However, it is subsequently revealed that this Xorn was just a puppet figure created by Charles Xavier II's mind powers after the real Xorn died during her final confrontation with her younger self. The former Brotherhood are freed from Charles Xavier II's influence and are returned to their timeline. The Ultimate Marvel version of Xorn (Kuan-Yi) and his twin brother Zorn (Shen-Yi) first appeared in the miniseries Ultimate Comics: Hawkeye and spread out to be included in other titles like Ultimate Comics: Ultimates and Ultimate Comics: X-Men. The Twins become the leaders of "The People", a genetically-altered species of superhumans that were produced by the Southeast Asian Republic/SEAR as super-soldiers, but later rebelled. The People are in possession of a Super-Soldier Serum that Agent Clint Barton aka Hawkeye is tasked by SHIELD with retrieving. This led to Shen forming the Eternals, while Kuan formed the Celestials. Hawkeye later leads Nick Fury, the Falcon, and Black Widow to the twin capital cities of SEAR in order to meet with Xorn and Zorn. The two brothers agree to help Fury fight off Reed Richards' invasion. On an alternate Earth, Xorn and his brother Zorn were members of the X-Men. They were killed by Terrax during the Cabal's attack on Earth-71202. In the "X-Men Legends" the "Mask of Xorn" is the final item a player can get playing the story mode and gives a character the capacity of performing mutant attacks without spending mutant energy. In the Marvel: Ultimate Alliance Heroes and Villains expansion pack, Xorn is the third unlockable costume for Magneto. In Marvel Heroes, the "Mask of Xorn" is a Unique item wearable by any hero. It has s chance to be dropped by Magneto when he is defeated. ^ Ellis, Jonathan (2004). "Grant Morrison: Master & Commander". Pop Image.com. Archived from the original on December 3, 2013. Retrieved September 16, 2006. ^ Baker, Jesse (2003). "Words Of Questionable Wisdom: We Hardly Knew You". Comics Nexus.com. Archived from the original on July 8, 2012. Retrieved July 1, 2008. ^ O'Brien, Paul (2003). "Review of New X-Men #146". The X-Axis.com. Archived from the original on December 14, 2006. Retrieved September 16, 2006. ^ Contino, Jennifer M. (2004). "Chuck Austen X-Men Writer". Comicon.com. Archived from the original on September 29, 2007. Retrieved September 17, 2006. ^ New Avengers #19. Marvel Comics. ^ "New Joe Fridays: Week 3". Newsarama. 2006. Archived from the original on July 20, 2006. Retrieved September 16, 2006. This page was last edited on 30 March 2019, at 06:51 (UTC).